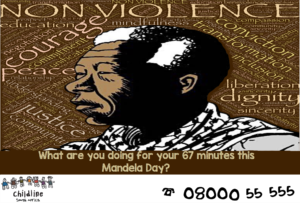 Madiba Day is fast approaching and we’ve come up with a number of ways in which you can spend your 67 minutes with Childline Gauteng. 2. Donate goods that we can auction. We will welcome any items that can be auctioned at the event e.g. restaurant vouchers, spa vouchers, collectibles, vintage items, electronics etc. Our monthly giving programme is the easiest way to provide steady support for the vital services Childline Gauteng provides. The most rewarding part of monthly giving is that you can make a contribution and help a child in need every, single, month. These items include non-perishable food items, shopping vouchers, toiletries, stationery etc. For over 30 years, Childline Gauteng has been a pillar of strength for children, families and communities – we’ve stood up for children’s rights and responsibilities, provided protection, counselling and support services to children and families, and have empowered communities with information and skills to protect and nurture children. Your support will help us take the Late President Nelson Mandela’s vision for the children of South Africa into the future. Please join us this Madiba Day to take the vision of a child friendly society forward! Your support can make the difference in the life of a child. We are asking you for “67”minutes. We are inviting you to come spend your 67 minutes with us at our Annual Telethon which is taking place on the 17 and 18 July 2018. By devoting 67 minutes of your time – one minute for every year of Mandela’s public service – you can make a small gesture in helping our organisation and our fight against child abuse go a long way. business associates to invite them to be SuperHeroes by getting them to pledge assistance to Childline KZN Network and have fun like the SuperHero you are! Mandela Day event on the 27th July 2018 at Sebayeng Primary School in the Mankweng area (Capricorn District).